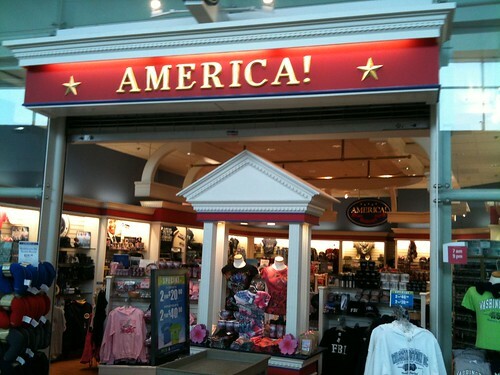 While I usually tend to walk everywhere, the problem with the US is that it is quite wide and full of empty space. I recently brought my bicycle back from my parents home, and I decided to go on a cycle-about this morning. I really enjoyed being able to get around so quickly on the cycle, and I think I may have caught the cycling bug. Only time will tell, but I cannot wait until next weekend when I can go for a ride again. 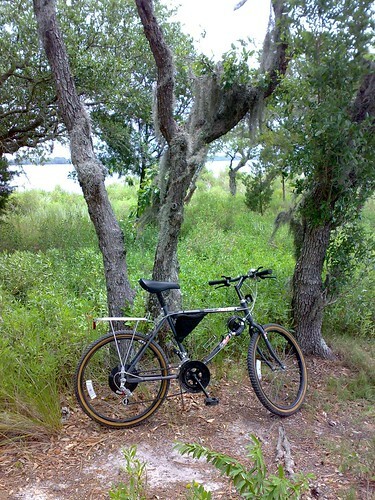 I’m going to have to buy a cycle rack for my car so I can cycle on some of the other islands around Charleston. My ride–I’ve had it since junior high school. I used to haul a trumpet and case around on the back of this bike along with a backpack full of English literature, Biology, and Mathematics textbooks. Biology and English literature in the same year…how awful and heavy the books were! Because my parents kept this bike in the garage all of these years, it has minimal wear and rides quite well. In true South Carolina tradition, “thanks maw and paw!” I suppose I’ll upgrade if cycling sticks with me throughout the year. For now I’ll build up my stamina and endurance on this ride. 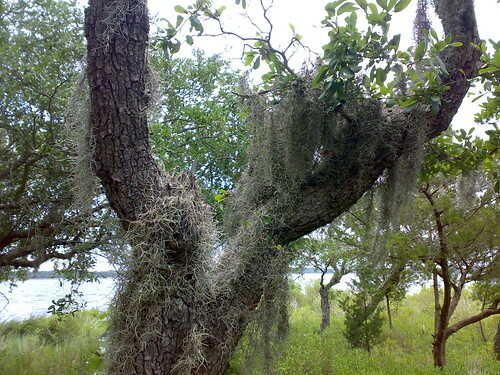 The white moss hanging off of this tree is Spanish moss. 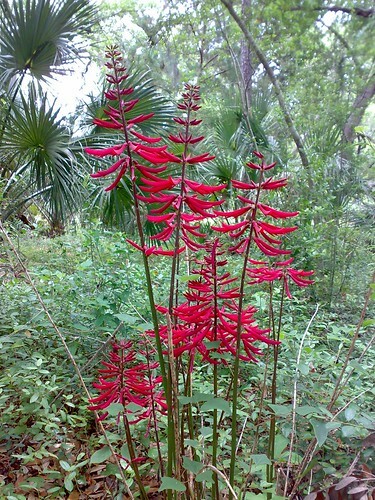 It is common all over the Southeastern USA, and when I first moved here I always wondered what it was. 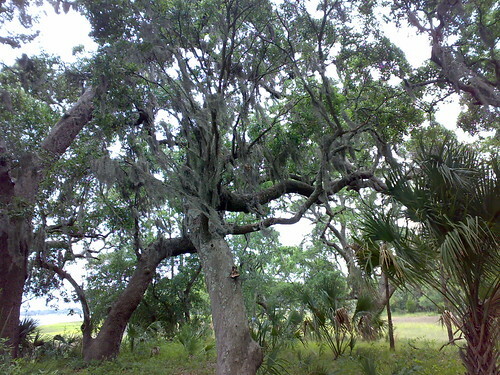 It adds a lot of character to the trees I must say. 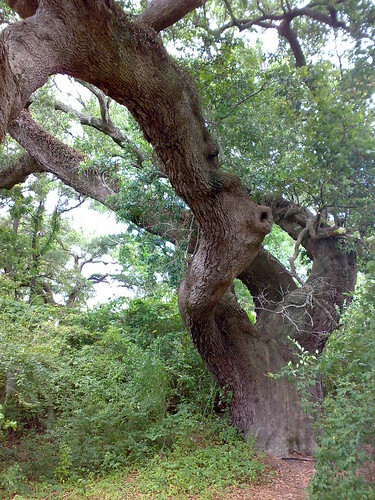 In the swamp the trees don’t grow straight up, they bend and arch in every possible direction. 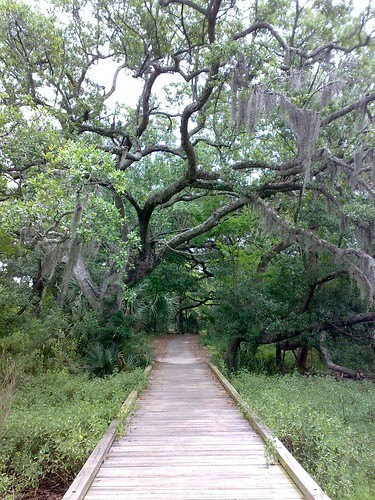 I don’t know what it is about these trees and the Spanish moss, but I always feel of melancholy when I see and experience this scenery in person. The reason I cannot cycle to work–this bridge has an aggressive incline and is packed with insane truckers driving very aggressively to get to the marine port on the other side of the bridge. Damn truckers! Having seen what happens to compact cars when the truckers smash into them, I wouldn’t even dream of riding my bicycle over this bridge, even if it were legal. 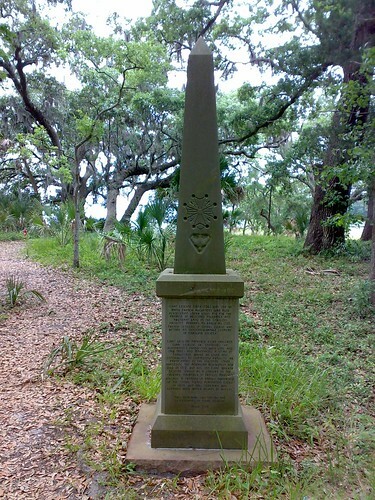 There was a leaf-covered path forking from the main athletic trail, and I caught this monument and decided to investigate further. 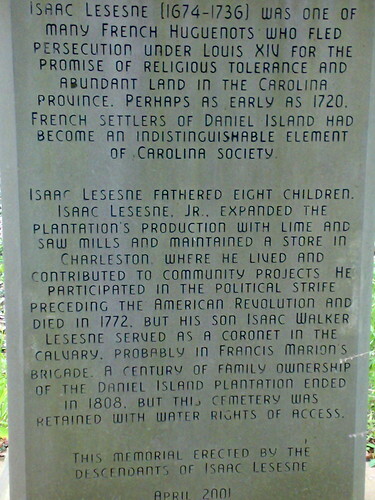 The Lesesne Family seems to have a long history around this area. Like many early settles in North America, the Huguenots fled Europe due to religious persecution. As much as it pains the academics, Europe and America are, despite a common cultural background, based on two different worlds and we will never see eye to eye on things. The people who settled the Eastern USA where by and large either seeking to make a profit or seeking religious freedom. It is important to keep this in mind even today. Further along the leaf path, I found a small cemetery, and with the help of Google, it seems that this is the Lesesne family cemetery. You probably notice the red flag, and if you’re American you know that to be the confederate states flag, the flag of the southern states during the Civil War. In South Carolina you find this flag all over the place in modern times, despite protests by African American rights leaders. As a native of Virginia, this flag and the civil war is a bit of a sensitive issue, and I was shocked to see this flag scattered so freely all over the place in South Carolina. Just recently there was a lot of heat about the Confederacy and its history in Virginia politics. Virginia was dragged into the Civil War, whereas confederates in South Carolina openly attacked the Federal government in South Carolina and made way for the war to happen at large. To this day South Carolina is still very set in its own ways. In most South Carolina news sources there seems to be very little interest in the global world. Washington DC is viewed with skepticism and the majority of news seems to be about state issues–even on public radio. The pride that South Carolinian’s have for themselves is both interesting and also sometimes astounding. South Carolinians are more humble than most conservatives in other states, however. They mainly just want to keep to themselves. 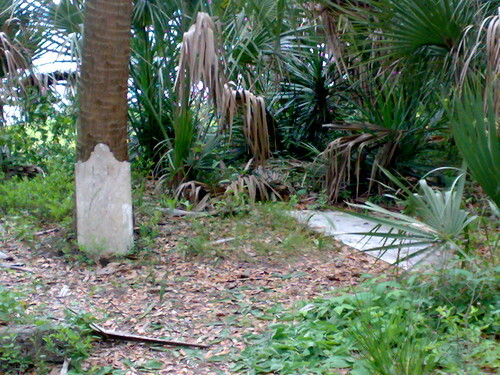 Some of the tombstones were so old that the engravings had been erased with the erosion of time. Rest in peace, Mr./Ms. Holland. 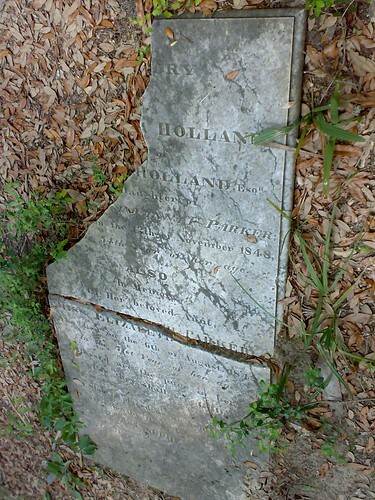 It seems this grave dates from November 1848. My Taiwanese friends would be scolding me for taking pictures in a cemetery if they knew about these photos. But this is living history! 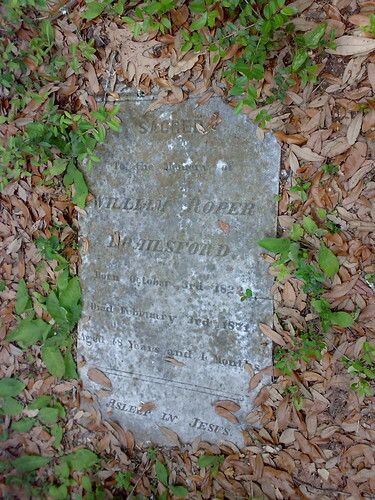 The headstone of William Roper Brailsford, 1822 to 1871, a veteran of the Confederate Army. 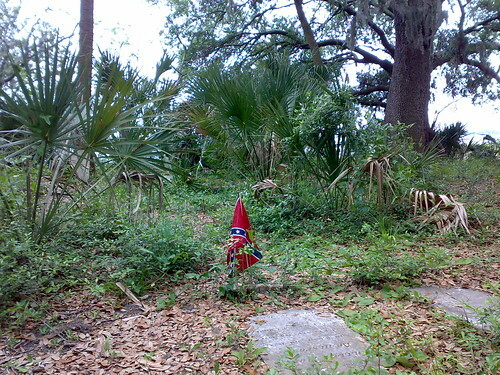 The flag was placed by his tombstone, by the way. From what I can tell, the Brailsford family were plantation owners in this part of South Carolina. With the palms rustling in the wind and the moss hanging from the trees, this atmosphere gave the Lesesne family cemetery a very spooky feel even in broad daylight. Nonetheless, I appreciate the efforts of the descendants of the Lesesne family still keeping these grounds and building the monument. Such monuments help remind us of history even though the world moves so quickly now. At the end of the trail I ended up under the bridge pictured in previous pictures. It is true, fascists censor art. 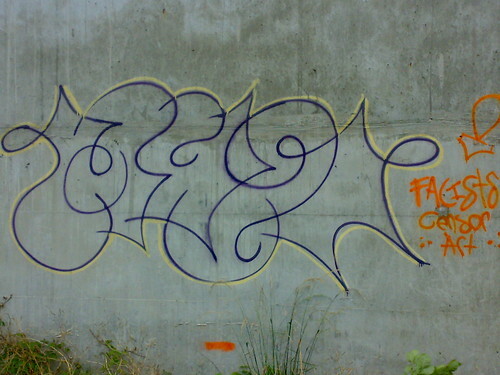 If only I could read the text in purple…I’ve always wondered if graffiti artists can read other graffiti artists writing. 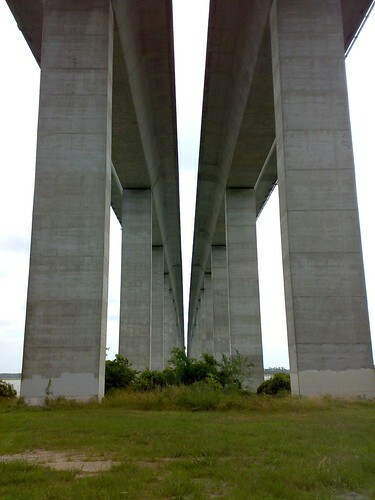 I love the symmetry here, especially the bridge support columns reaching a central spot in this photograph. 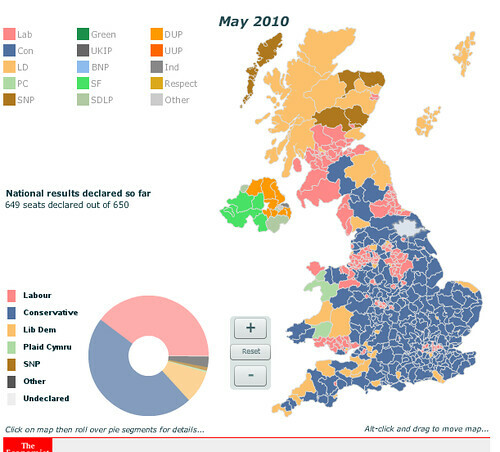 Central limit theorem…any one? The humidity is starting to really build up, and the sun is quite unbearable during mid-day. Almost every evening there is a short rain shower that lasts no longer than thirty minutes, and it adds to the humidity that was just starting to recede due to the time of the day. 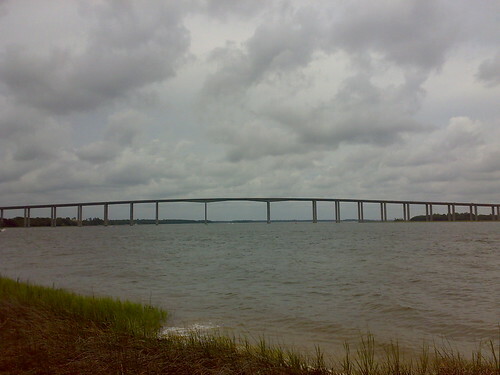 It is the rain season in Charleston, yes su’h. 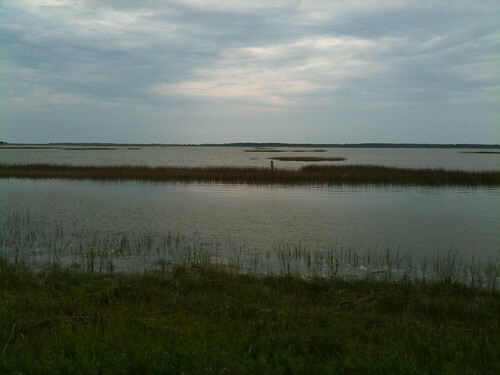 Evening showers are a typical part of thlate-spring, early-summer weather in coastal South Carolina. 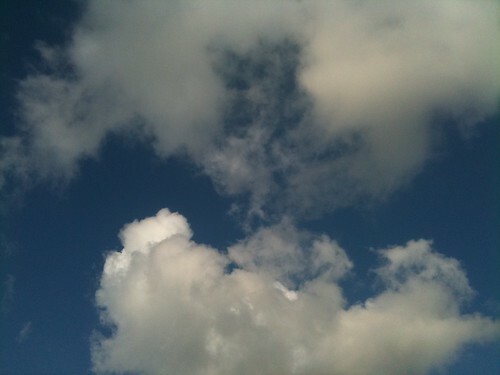 When it does not rain, the skies are blue and the clouds move by quickly. Thankfully, the sea breeze makes life here bearable. 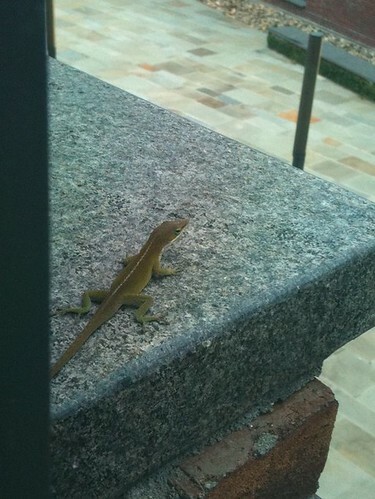 A gecko scaled the building at work and made it to a ledge on the second floor–perhaps he was looking for shade? In less than two weeks now we’ll have the opportunity to enjoy World Cup football action. Unlike J-League in Japan or Major League Soccer (MLS) in the USA, I can enjoy watching world-class footballers take the stage, and what a difference they make! If you don’t believe me, watch a few J-League matches. There are no cartwheels after scoring a goal, no bicycle kicks, no red cards, no jazz-like movement with the football…just very technical football. Contrast that with a very professional league like the British Premier League, where the forwards are always pressing the defense and the action in non-stop during each half. And look at MLS, even Beckham, facing the slower half of his career, wanted to get the hell out of there! Oh how I’m looking forward to the World Cup!!! Growing up in the USA, I never really thought much of soccer. It just wasn’t my sport, and MLS never managed to catch my attention. In 2002, however, I was in Japan for a summer internship, and it just happened that Japan and Korea were co-hosting the World Cup. Japan was mad with football fever; the female population adored Beckham, and the male population was enamored with the Japanese football team. I started watching the games in a local izakaya and even in my dormitory room. I instantly fell for the Brazilian team…watching Ronaldo work his magic with the football could be paralleled with watching an artful dancer. I also cheered for Germany because Oliver Kahn, the goalkeeper, managed to make the most amazing saves at the most impossible times. The more that I watched the World Cup football matches, the more I realized that the strategy was very similar to my favorite sport: ice hockey. Scoring is very similar–shoot straight if you think you can take the keeper, or set someone up with a quick shot trying to beat it past the keeper. I’m looking forward to the World Cup this summer. ESPN will be broadcasting every single game–hopefully in HD–and I should be able to watch my favorite teams. I rent a DVR from the cable company, so I can record the games that are difficult to see due to the time difference. It is odd, but in the USA you cannot buy a regular hard disk DVR. You either have to subscribe to TiVo, a monthly service on top of your regular bills, or you have to rent a DVR box from your cable or satellite provider. I guess recording to DVD is another option, but much less flexible and certainly doesn’t store as much. In the realm of consumer electronics, Japan is light years ahead of the USA. But that isn’t really a surprise now is it? I sure do miss the old analog DVR I purchased in Japan for just 10,000 yen (US$100). With the World Cup in South Africa, I think everyone is hoping for an African team to do well. I really liked watching Cameroon play in 2002, and I hope they do well this year. Ghana’s team always seems to happy to play in the World Cup, and I hope they do well too. I’ll be pulling for Brazil as usual, hopefully they’ll be putting on a good show again. I’ll look forward to England as well, I liked watching Wayne Rooney play the past couple of years in English football. He’s not a pretty-boy like Beckham or Christian Ronaldo (Portugal), but he’s a good team player. South Korea should be an interesting team to watch too. They played very well in 2002 making it to the semi-finals, and they were not bad in 2006 either. It would be interesting to see them make it to the semi-finals or finals this year. The ol’ USA is in an interesting bracket with England, Algeria, and Slovenia. England will be the team to beat in the bracket, but Slovenia also has a team on-par with the USA, and Algeria may offer up some surprises too. South Korea faces Argentina, arguably one of the best teams globally, and they also face Greece and Nigeria. Wouldn’t it be hilarious if the Greeks took the World Cup after all of the crap they are getting in the financial markets? Brazil faces North Korea, Côte d’Ivoire, and their old colonial mates Portugal. North Korea has a lot to prove and will surely be feisty, and Portugal and Côte d’Ivoire are strong teams as well. I need to dig up my Brazil football t-shirt before the first game. My son also has one that he received from his grandfather’s Brazilian colleagues, I’ll have to dress him up for the first Brazil game too…though he’ll probably be more busy playing with his toys than watching the Brazilian footballers. Put on a good show this year Brazil, give the world of taste of what is to come in 2014 in Rio de Janeiro! I was back in DC, this time to pick up my wife and son at Dulles and spend a weekend in the Capital. Unfortunately, I forget to bring my camera, and I had to fall back on my mobile phone camera this time. 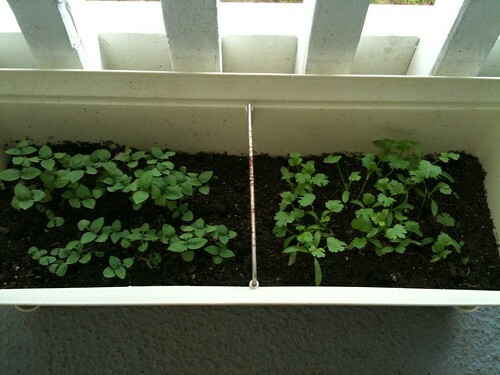 As a result, I didn’t take as many pictures this time. I managed a few though, and of course had another good walkabout in my favorite American city. 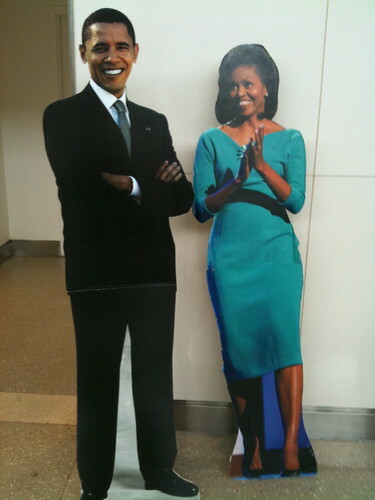 Being a VIP, I was greeted by the first family at Dulles. I had to turn down the invitation to the state dinner unfortunately. I had a previous engagement to attend. The first day my wife and son were extremely jet lagged, sleep deprived, and generally just exhausted. So we picked up the rental car and I drove the family around Georgetown and downtown Washington DC just to get a feel for the city. We checked into the hotel at 3 PM and rested for awhile, then grabbed a hamburger dinner, and upon returning to the hotel the weary travelers fell asleep 19:00, leaving me to read in the hotel room for the next three hours. Luckily I brought “Interzone” by William S. Burroughs, quite a fascinating read! It was a good thing that we stayed in the hotel, however, as the skies opened up and a quick thunderstorm engulfed the metro area around 19:30. The next morning, my son crawled next to me and began slapping me on the chest. It was still dark outside, and it was 5:30 AM and he was ready to go. Might as well get an early start, right? As the morning progressed I found the skies to be clear and the humidity to be significantly less. We made out for “the Mall”, the green area in the middle of the Federal district of Washington DC. 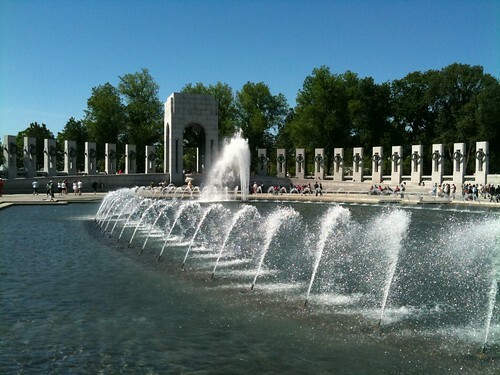 The World War II Memorial – each of the pillars surrounding the fountain represent one of the fifty states or one of the American territories. The tower to the end marks the Pacific front, and behind me is the tower for the Atlantic front. In front of the towers are small fountains that have the names of the battles engraved into stone. 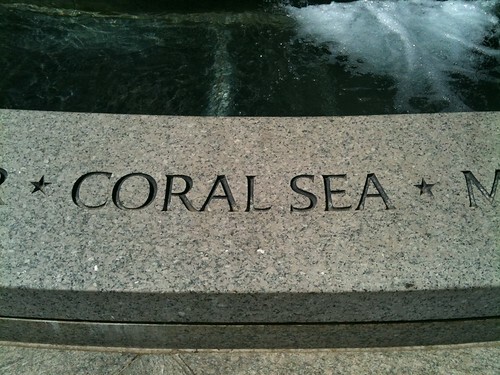 I remember hearing about the battle of Coral Sea growing up. Of course on the Pacific side you also have the battle of Guadalcanal, Siapan/Guam, Okinawa, and even Japan. The Atlantic side has engravings for Normandy and all of the the major battles in Europe. While the World War II Monument lies at one end of the reflection pool, the Lincoln Memorial lies at the other. Back in 1999 I took a great photo just before dusk of the Washington Monument (the huge spike in this picture) projected into the reflection pool. The pool now just collects rain water, and I overheard some locals stating that the Parks and Recreation Dept. turned off the water because of budget cuts. 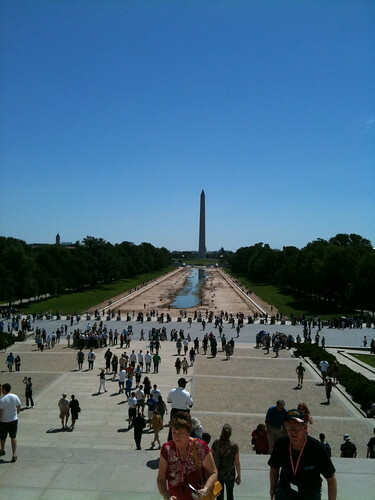 Perhaps the reflection pool is also a reflection on the state of the American economy? The White House – it is hard to make out, but there is a black fence about 100 meters forward, and in this picture it would be in the center. 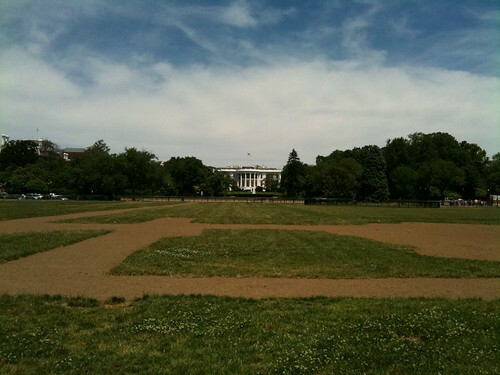 Back in 2003 you could stand at that fence and get a much better view of the White House. Now there is a metal chain link fence pushing the public back another hundred meters. On the other side of the White House the streets are all closed and are heavily guarded. Even though the White House and Reflection Pool were disappointing, the weather was fabulous, there were plenty of other families out and about, and the walk around the Mall was really worth it. It was getting close to lunch time so we headed to Pentagon City by metro for a food-court lunch and fulfilled the missus’ desire for shopping. We bought Liam some summer sandal shoes, and as soon as we left the shoe store he had already taken one of his shoes off and tries to throw it away. This boy really doesn’t like shoes! We returned to the hotel for a short rest, and around 6 PM we headed out for Alexandria, VA.
Alexandria is a very old town in Virginia that has become quite a tourist spot. 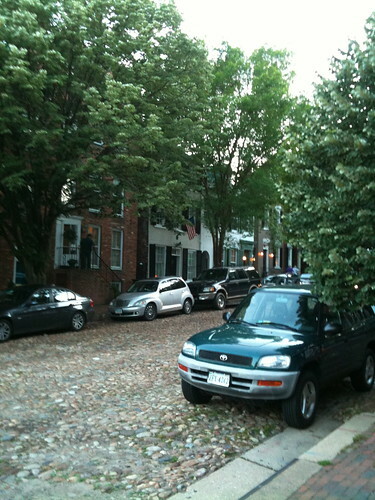 The Old Towne area has beautiful row houses and a park on the water front. 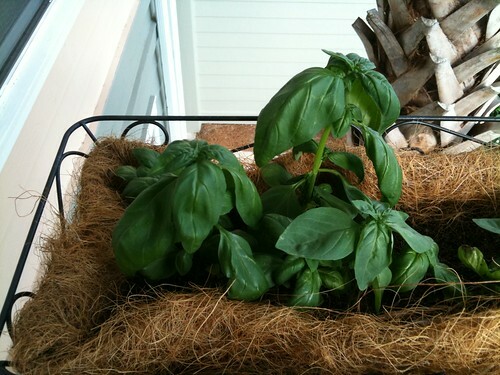 There are many art galleries, boutique shops, and fancy restaurants as well. It’s not a town for children for sure, the sidewalks are narrow and the restaurant tables are packed together as tightly as one finds in downtown Tokyo. It also seems to be a meet-up place as there were lots of young people, salaried professionals enjoying their “single” days. 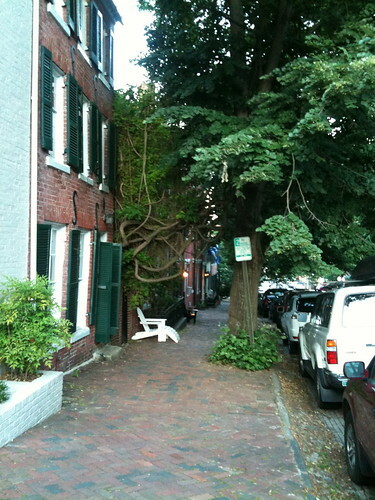 The trees grow around the houses – these houses have probably been here longer than the trees! 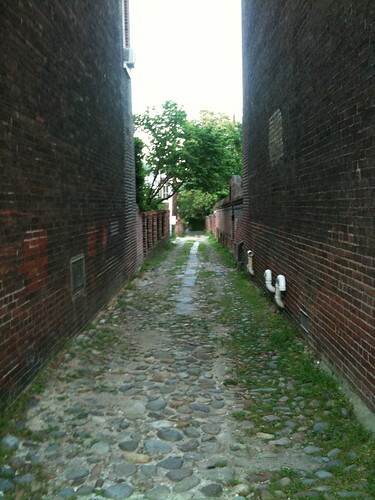 Such a wide alley with nothing in it! Roughly, this film is about a small city in Taiwan that is having a concert which will feature a famous Japanese artist as the headliner, and a local Taiwanese band as the opening act. The city council chairman wants to show to young people that they don’t have to migrate to big cities to make it on their own, and he believes that a big concert event like this could help the town’s image. He struggles to pull the town together and find a group of people with enough skill to play in the opening act. The story is not complex and is somewhat predictable, but the film has the timeless melancholy feel of so many films produced in Asia. In my opinion, the most fascinating thing about the film is that it features three languages: Mandarin, Japanese, and Taiwanese. The Taiwanese was like a completely alien language to me and had it not been for the subtitles I would have been completely lost. The scenery is spectacularly filmed, the small city really felt like some of the small towns I had wandered through in Taiwan. The film also flashes back to the narrative of letters from a Japanese school teacher to a woman in Taiwan whom he left behind. I won’t get into the plot of the letters, but they play an important role in the film and perhaps even have some artistic meaning at some level–never my specialty really. Perhaps the the guilt and resent in the letters represent how the director or writer feels toward Taiwan as a colony of Japan, or the Japanese having to leave Taiwan? It’s not the best film I’ve ever seen, but it was worth the time spent watching the film. I especially enjoyed the “Malasan!” alcohol sales guy. I first saw part of this movie when I was living in Japan back in 2006. I stayed up late one night, not wanting to go to sleep due to work related stress, and I stumbled across this film. I managed to watch half of it, but due to exhaustion I felt asleep halfway on my sofa and never got to see the end. I have been waiting since 2006 to see the end of this movie and I never could find it at Tsutaya–the Blockbuster Video of Japan–and finally after all of these years, I found it on Netflix. This is a Thai film is about a suicidal Japanese man, Kenji, who works as a librarian in a Japanese government sponsored library in Thailand. His brother is an Osaka gangster–after all, everyone in Osaka is a mobster–who has fled to Thailand after sleeping with the boss’s daughter. His brother comes and causes a big disturbance in his life. While contemplating suicide, he witnesses the death of Nid and crosses paths with her sister Noi. The story follows Kenji and Noi and how they deal with the troubles they find themselves in. I have two things to say about this film. The first is that the cinematography is fabulous. As is commonly found in Japanese cinema, the camera is often left at a fixed point, and we watch the actors move around in their environment freely. We feel like spectators sitting in the corner of the room watching events unfold with no power to do anything. The other is that I’m at a loss for words why most films in Asia are always about gangsters. Whether the film be from Japan, Hong Kong, or Thailand, there is always some gangster plot. Perhaps all of the movies producers are gangsters or ex-gangsters? One last note: if you don’t like films that make you guess and think about what the scene is trying to communicate, you probably won’t like this film at all. The director likes to play with the imagery and use “day dream” scenes to create dual paths of reality: what might have been, and what is.